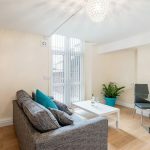 Stylish, contemporary 2 bedroom apartment situated opposite Plymouth University and a few minutes walk from Plymouth College of Art. Furnished to an exceptional standard, this stunning apartment boasts high ceilings, lovely big windows and good sized rooms. The spacious, open plan living area contains a sofa, dining table and chairs, and an attractive, modern kitchen section with a washer/ dryer, fridge freezer, oven, hobb and hood as well as plenty of storage. Both bedrooms are well proportioned with double beds, desks and built in wardrobes. The fitted bathroom offers a shower, WC and wash hand basin. With a virgin media fibre internet connection hard wired direct to each bedroom desk and soundproofing throughout, we really have thought of everything to make your apartment a real ‘home from home’. 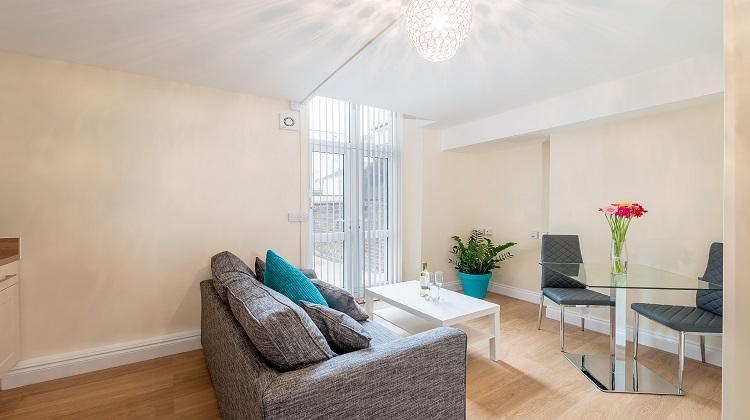 Our student apartments are within 250m of Plymouth Uni. Room prices are inclusive of electric, gas, water (upto a usage cap of £10 per person / week). We do not require deposits, admin fees or guarantors, and offer individual tenancy agreements. As owners of our student apartments, we have a vested interest in ensuring they’re maintained to a high standard – as such our maintenance service is probably the best you’ll find!